Everyone has a genetic potential but few will get to experience the benefits of it. We can all have improved facial aesthetics by having the optimum jaw and bite position with our existing bone structure. 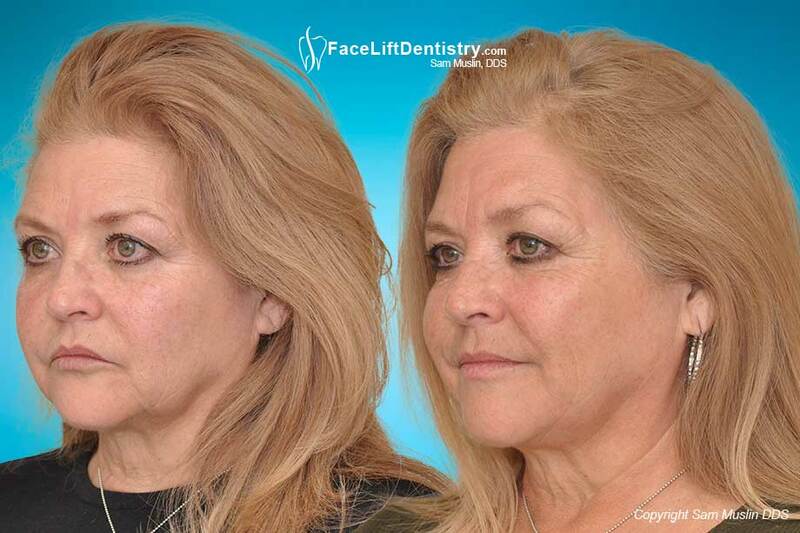 The secret to maximizing your genetic and aesthetic potential is the Face-lift Dentistry® Method. We can live our lives with the wrong bite and jaw position for our faces, or we can optimize our health and our appearance by correcting the bite. She wore braces years ago and the results were not stable. Her overbite returned and with years of clenching and grinding and one doctor recommending jaw surgery she found Dr. Sam Muslin’s method. The goal is to keep her natural physical characteristics and improve them by building the bite that she should have always had but never had the chance to experience it until now. After his examination, Dr. Muslin did not think that jaw surgery was necessary and he began developing his method and testing a new jaw position for this patient. There is no pain or force in developing the jaw position because it is really the natural position for the patient. We get asked, how do you move the jaw? JawTrac® will locate that position and we will test that position to prove that you are comfortable with it. 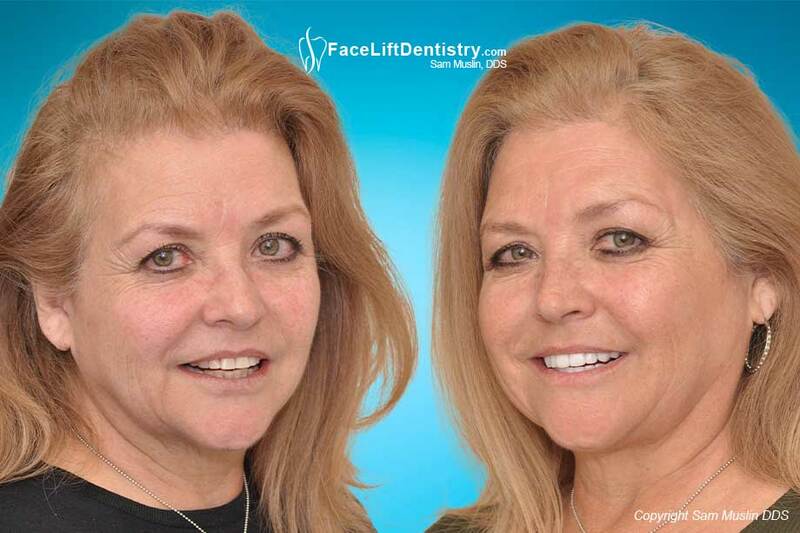 When a patient smiles and has the optimal jaw position and facial support of her new teeth, the face looks younger cosmetically but she is out of pain so she is now experiencing a pain-free existence. I gasped when I saw the outcome and was dancing with joy! When you are not “optimized” you are physically compromised. This treatment method is all about taking your health and appearance to the highest level without facial fillers, face-lifts, jaw surgery, braces, porcelain crowns or porcelain veneers which require grinding down your healthy teeth. This patient was in pain before treatment and received significant relief after treatment. Don't Blame Genetics - It's The Bite! To be able to make a patient this happy with your treatment is one of the most rewarding experiences a doctor can have. One of the most frustrating things that dentists do is drill down healthy teeth for cosmetic dentistry. It seems crazy to Dr. Muslin, and he knows because he used to do it 30 years ago. Today, technology has surpassed the old invasive method of grinding down healthy teeth for porcelain crowns or porcelain veneers. VENLAY® Restorations do not require drilling down healthy teeth. It's about your face and not just your smile. She lost the facial support of her teeth and never had the ideal jaw position for her bone structure. This is about locating your maximum biologic potential with the ideal jaw position using JawTrac®, VENLAY® Restorations and the Dental Face Lift® method which is the same method as Face Lift Dentistry® that he developed many years ago. Don’t be misled by dentists trying to trick you. They are advertising “get a face-lift with dentistry” when they will grind down your teeth and have no knowledge of this non-invasive method. This method changes lives and helps patients experience their own individual maximum potential. “Be the person you were meant to be”. Cosmetic dentistry is just about your smile. Porcelain veneers cannot correct bites. 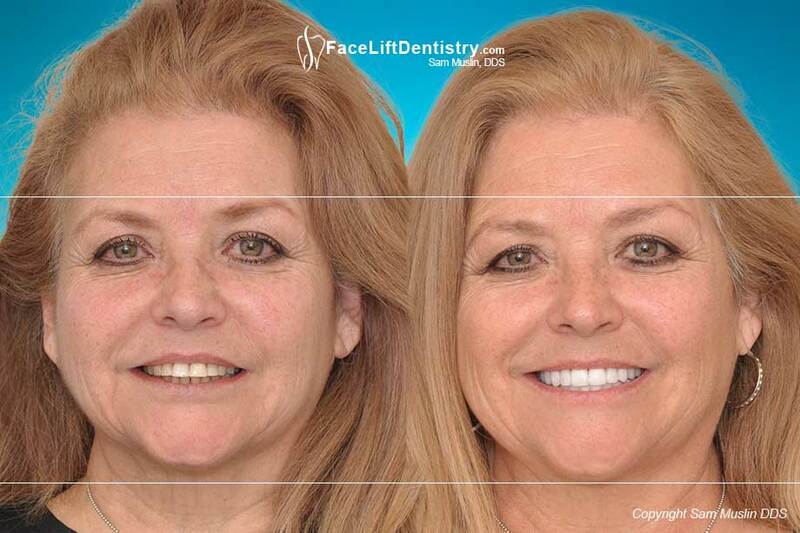 The Face Lift Dentistry® Method can build a smile that exceeds the traditional cosmetic dentistry, porcelain veneer type of dentistry because it corrects your bite and maximizes you biologic potential. Dr. Sam Muslin would like to express his sincere gratitude to this patient and to every patient in this website for giving him written permission to show their faces. If you do not give written permission, your privacy will be protected. 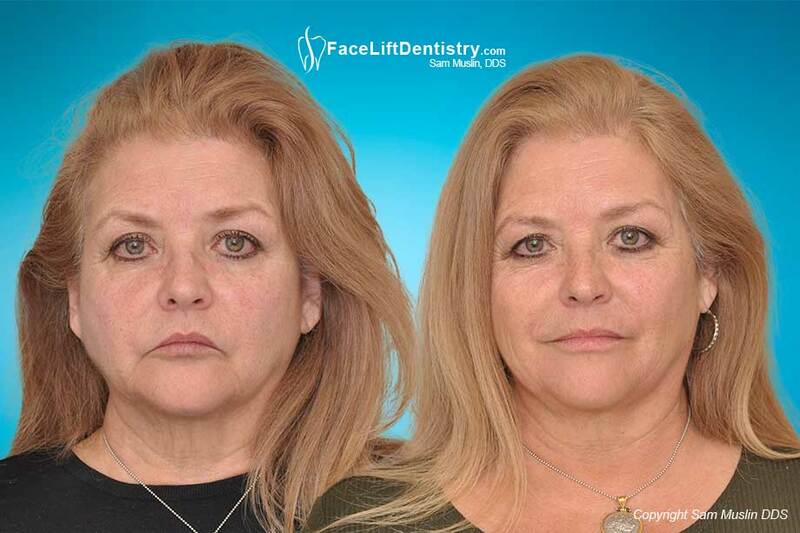 Need to Learn More about the Facial Aesthetical Benefits of Face Lift Dentistry?